In San Francisco, I broadly categorized cafes into two categories. In the first, everything is clean lines (including the pastries), the tables and walls are immaculate, and everybody has a Macbook. In the second, everything is in piles (mm pastry pile) the furniture is mismatched, and everybody still has a Macbook. Usually, I prefer the latter — I like to feel like I can sort of disappear into the background rather than stand out in the foreground. 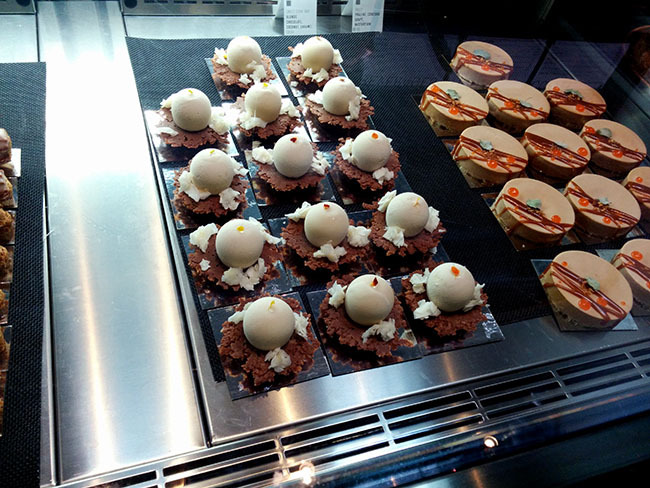 But, there’s no better reason for exceptions than exceptional pastries, right? 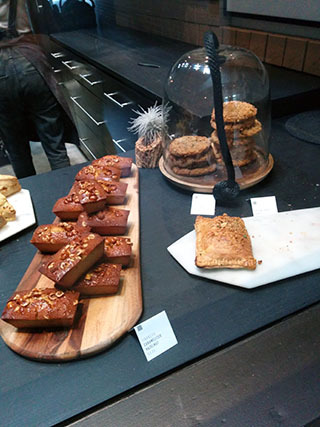 It’s super sleek-looking, but the staff at Craftsman and Wolves are very friendly and have fielded many of my questions about their extensive and very interesting pastry collection. 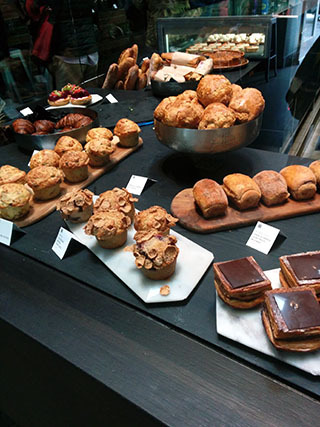 And, seriously, those are some good-looking pastries. 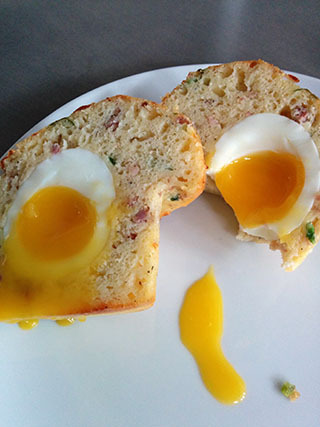 One of their most famous, of course, is The Rebel Within, which is a savory muffin with, astonishingly, a soft-boiled egg inside. I’d avoided it for ages because it has bacon in it, but this particular day, my will was weak, and I gave in. It was really, really good. It may have also been the coffee, but I was actually shaking a little as I ate it and tried to take some quick pictures. (At $7 a pop, I wanted to remember it.) 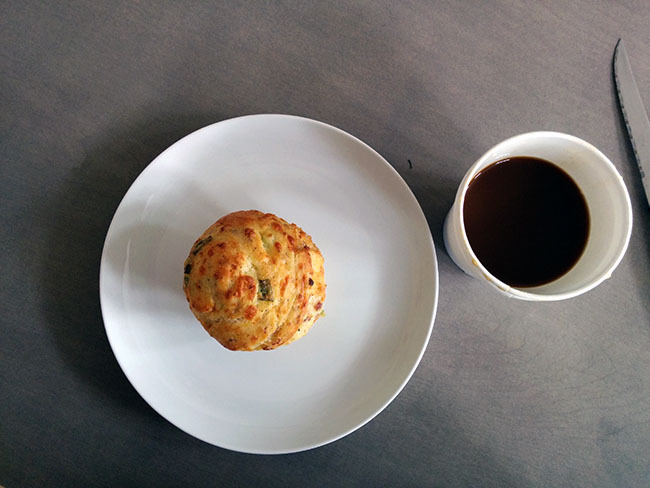 The muffin is dense and savory, and the egg really was perfectly soft boiled, which is something I struggle to do even without the muffin part factored in. I tried to figure out how they do it — maybe flash freezing the egg? This is one pastry I can confidently say that I have no idea how to make at home, so I only feel a little ridiculous buying it. 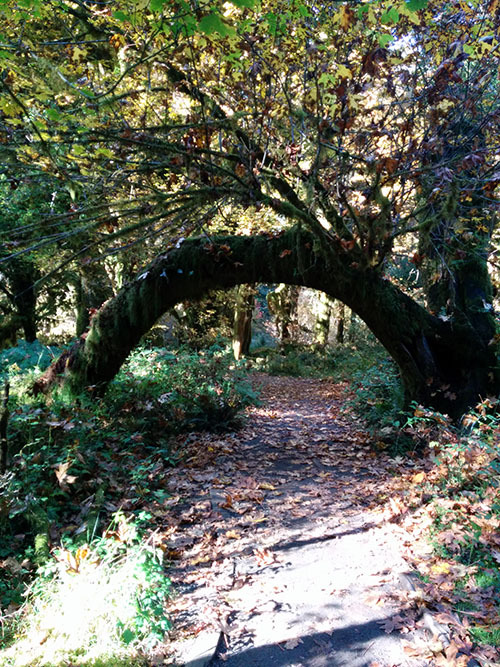 A couple months ago, I jaunted off to the Pacific Northwest again, but this time to visit Erin. 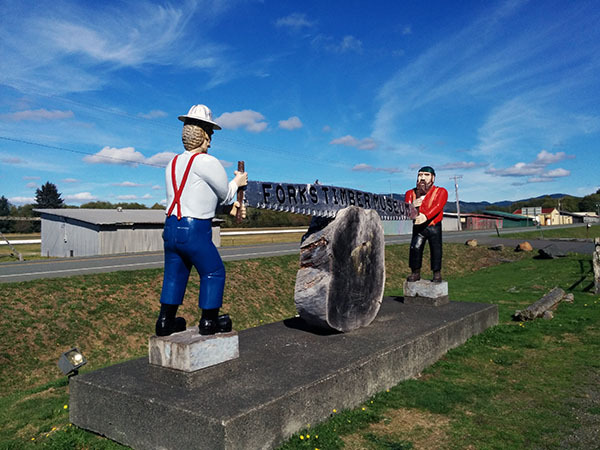 We had a great few days filled with finding scenic nature and delicious things to eat, and I was more than a little excited that our travels brought us through Forks of Twilight fame. 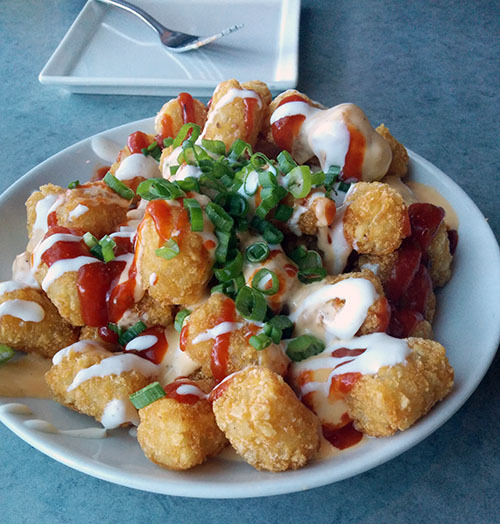 Our meandering brought my stomach through my favorite, Cupcake Royale, the infamous and maybe-closed Paseo, a great pizza place in an otherwise terrifyingly empty city, andsomewhere called Lunchbox Laboratory that did some black magic with tater tots. In the non-eating category, which we all know is difficult, we drove a car onto a ferry, shamelessly participated in some Twilight tourism on our way to the Hoh Rainforest, and took lots of scenic pictures near all the pretty nature in the area. 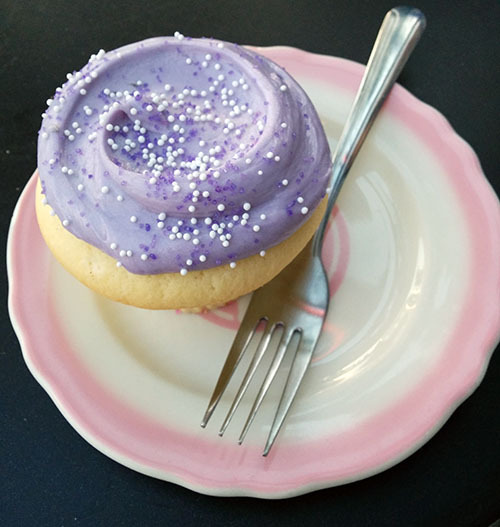 Cupcake Royale. I want this in my mouth. Lunchbox Laboratory. I can’t even. 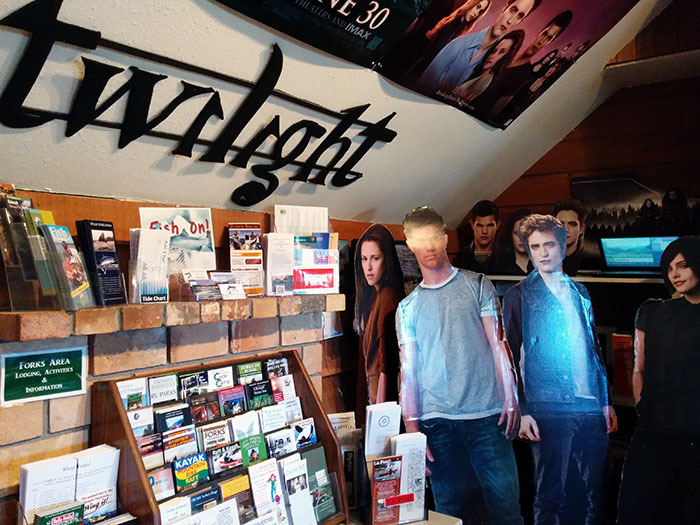 Welcome to Forks, sleepy lumber town turned vampire central. This made me deeply happy and uncomfortable. Thanks, Erin, traveling but generous host Kim, and new friend Seth for a great visit! 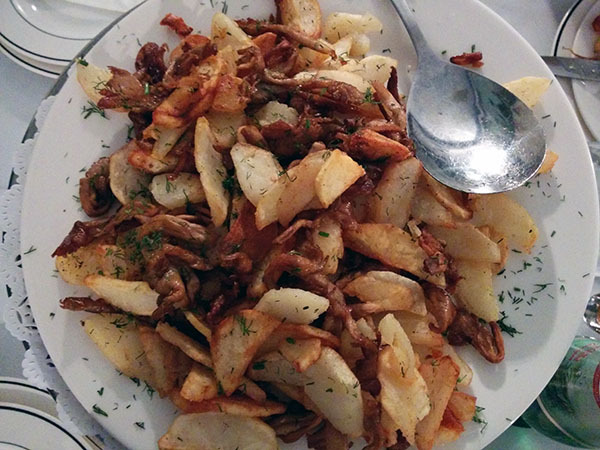 After reading this account of a meal at Pirosmani in Sheepshead Bay, I became actually obsessed with the idea of eating Georgian food. I knew that it was destiny (or that I was really unhealthily obsessed) when, a few months later, I learned I was traveling to New York for work. After a bit of panic that the restaurant was closed and lengthy subway rides, Victoria and I finally arrived at Pirosmani. And it was glorious. For anyone who’s spoken to me since September, I apologize, because I’ve probably already told you about this place and then deemed Georgia (in Eastern Europe, not in the Southern US) my “spiritual home.” But, I mean, the things they do to cheese and bread… it’s beautiful. We started off our meal of cheesy bread with just bread, of course. It was warm and chewy and salty with a very crispy crust, and I had difficulty restraining myself so I could eat more other stuff later. And, of course, the real reason I wanted to go to this restaurant. I feel like I don’t even really need to say anything about it. 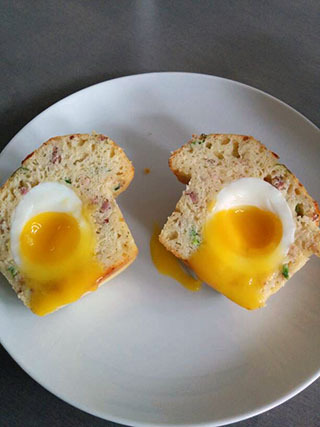 It’s obviously a boat-shaped bread filled with cheese, an egg, and (soon) butter. It was amazing. 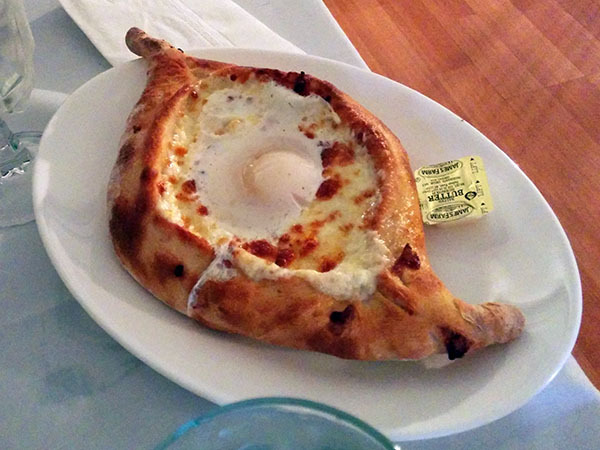 Adjaruli Khachapuri getting all mixed up, Pirosmani. See what I mean about Georgian food and perhaps my spiritual home? And then, of course, because we had not had enough beige food, we got a huge platter of deep fried potatoes and mushrooms. The spoon that is pictured is enormous, so don’t be confused about scale. This is a big plate. There was nothing not to like about this plate, of course. Both the potatoes and mushrooms were fried perfectly and crisp and salty, and I’m literally drooling a little bit writing about it, so I have to stop. I am fairly certain we also got chicken swimming in garlic butter, but I can’t find a photo of that. 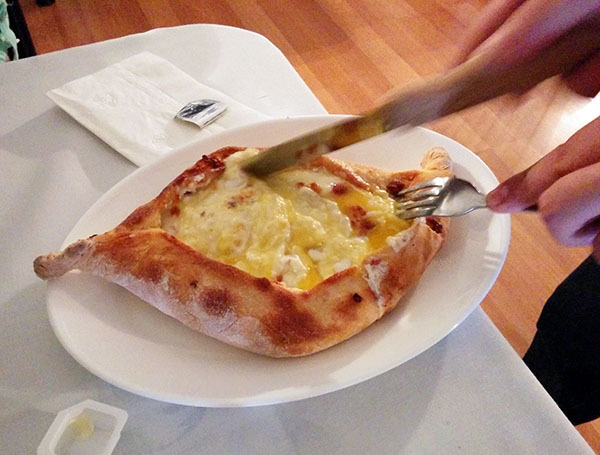 But let’s be honest, we’re all in it for the cheese bread, right? About a month and a half ago, I went to New York for work, but I had the great fortune to also spend some extra time with friends and eat my way through as much of the city as possible. I wish that I had been able to stay for longer, but the one good thing about my limited time was that I didn’t even feel bad about doing my only sightseeing with my mouth. Priorities. I took a redeye from San Francisco and landed, pretty exhausted, just in time to squeeze on the subway for rush hour. Muddling my way through that, I emerged, and my friends Victoria & Phil graciously welcomed me into their studio, where I proceeded to pass out. 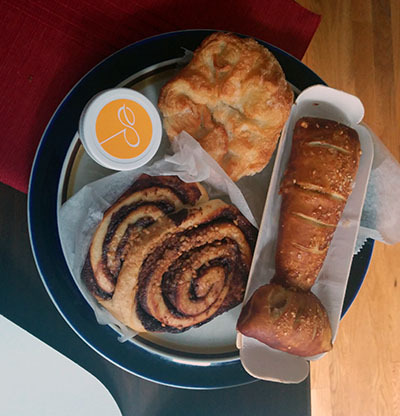 Upon waking, I found that Victoria had picked up some treats from City Bakery, because I am the most spoiled, so we nibbled, and then set off to go eating. First stop was al di la, a charming Italian place apparently favored by Deb. I could see why. 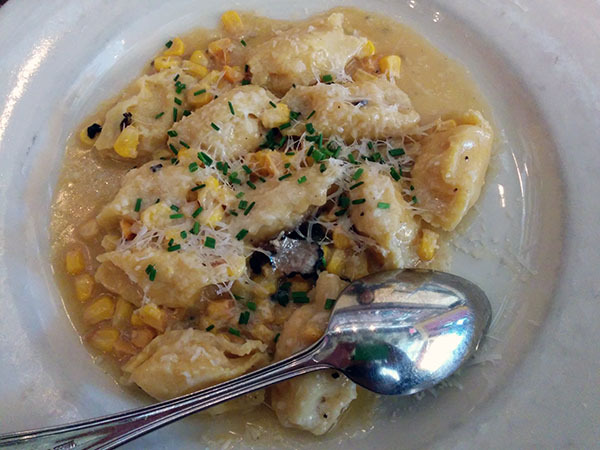 I had some fresh cheese and corn filled pasta. Tortelli? I forget the exact name for the shape, and I can’t quite discern it. But whatever, they were delicious. Rich and sweet from the dairy and corn, with chives and a tiny amount of truffle to make it savory. Victoria got some sort of polenta that was also quite good. 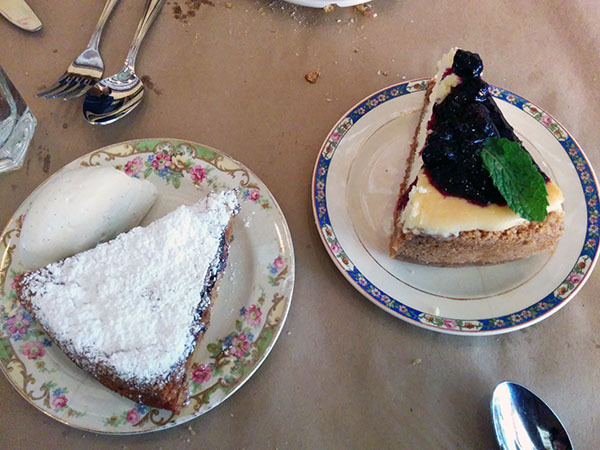 And, of course, we got two desserts. The pear and bittersweet chocolate tart was incredible, and I can see why it’s so loved. Layered and not-too-sweet, but with the whipped cream, definitely a treat. The cheesecake was definitely pure decadence. I mean, cheesecake, what’s not to like? 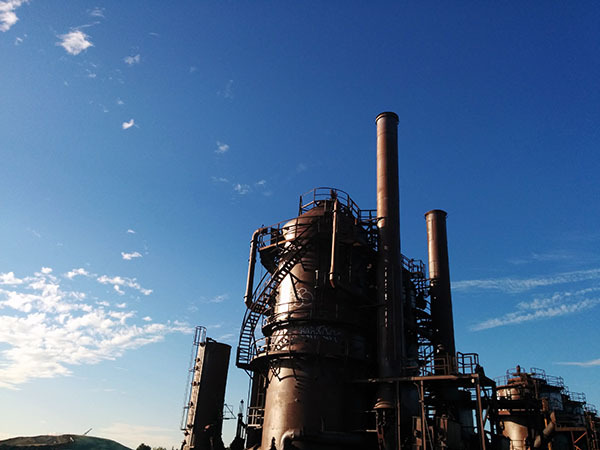 Later, we met up with my friend Shelly, and we wandered around, chatted, and ate Ample Hills ice cream. It was fantastic, obviously. 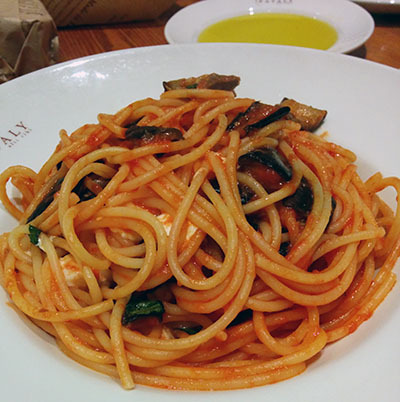 Since we hadn’t eaten enough pasta, for dinner, we set off to Eataly, which is sort of like a theme park that is Italian-food themed. It was particularly magical in that though it’s definitely a tourist destination, the plates were very, very good. The pasta was cooked beautifully al dente, and while a large portion (I still finished it), showed a lot of restraint that I lack at home for sure. That night, I remember sleeping like the dead. Massive kudos to gracious hosts Phil & Victoria for dealing with an unconscious Jade in the middle of their studio. The next morning, we set off to Dominique Ansel (of cronut and various pastry fame). After some very difficult decisions, we left with a bag that was so large that a woman asked, “Is that all pastries?” Yes. Yes, it is. And, I mean, there’s everything to like about all the pastries. They’re playful and fun but all very well done. The kouign amann, a favorite of mine back home, was buttery and caramelized with a nice “light” texture. The “lobster tail” is pretzel dough that is then somehow mixed with caramel and peanut butter (one of these is a dipping sauce) that was obviously delicious. The Nutella milk buns were fluffy and enriched and reminded me of pastries from an Asian pastry shop, though with Nutella instead of red bean paste. 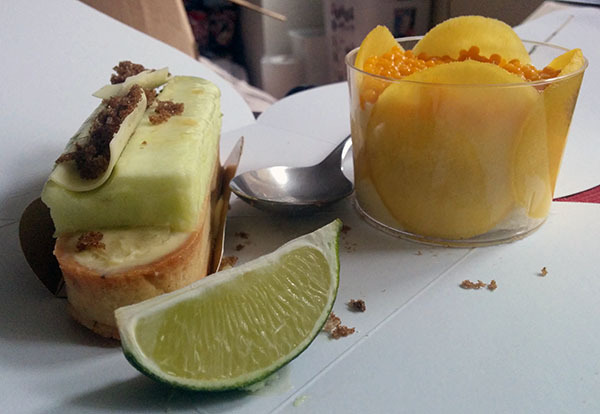 From this post, I was intrigued by the Lime Me Up Tart and Coco-Mango Riz Au Lait, which I think were two of the most playful offerings that day. The lime tart had a shell filled with custardy, tart filling, like key lime pie, upon which you sprinkled sugar or squeezed lime to your liking. The mango item is coconut rice pudding paired with mango slices and mango “pearls,” which I thought was a fun way to enjoy that classic flavor pairing. 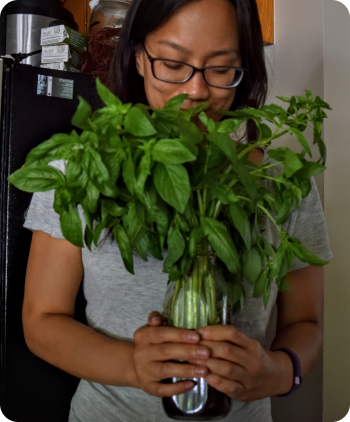 I eventually went off to staff the conference for work, where, I swear, I ate only vegetables, because up next were a few rich work dinners, and then a meal so mind-boggling that I’m saving it for another post! Also, this one is really long. Udupi Palace is a vegetarian Indian restaurant that serves enormous plates with little sauces and maybe curries and various doughs as vessels. The Internet tells me it is southern Indian food, but I really have no idea. But I do have a fervor for doughs and spiced sauces. 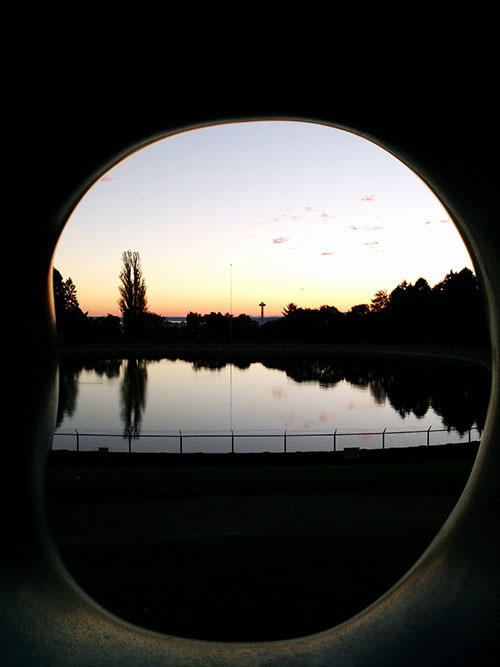 I always insist on getting “one of the giant puffed doughs” there, though I can never remember the name… so I have to furtively Google every item on the menu until they look right. 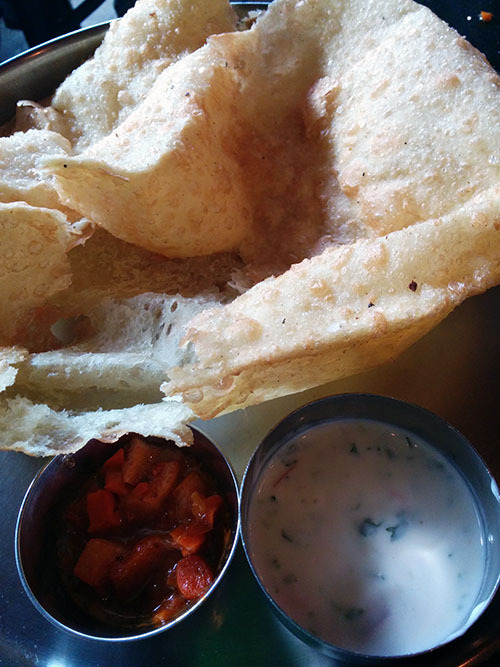 But, for posterity and for the common good, these things are called batura, and they are amazing. They are these large, puffed, chewy and flaky bread that comes with a sauce or two, and maybe a chutney? It’s all sort of a blur after you deflate the bread and start digging in. 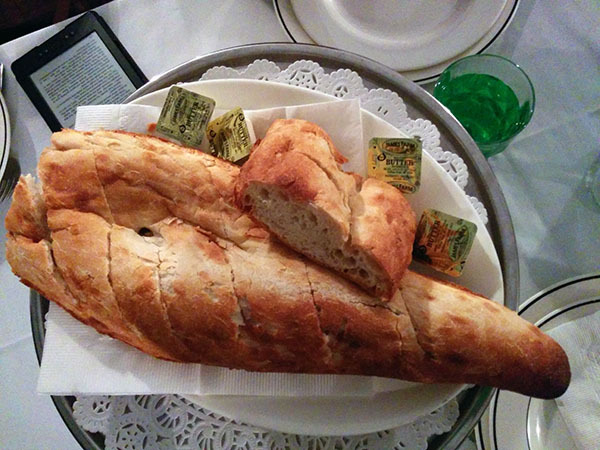 Next, we have a giant roll of crispy crepe-like bread (seriously like the length of my lower arm) that comes with a whole suite of new sauces, some of which are savory, or tangy, or sweet. 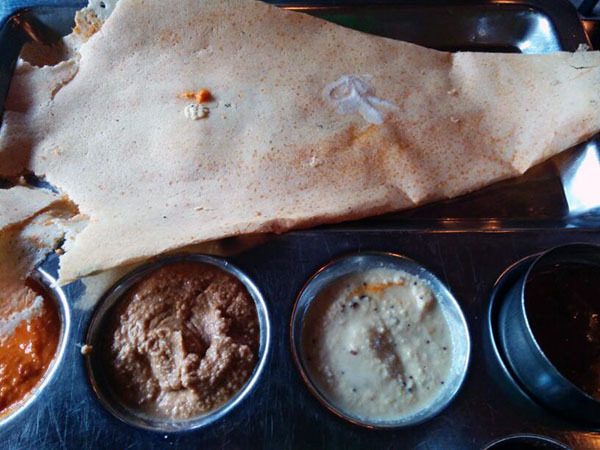 The giant, thin and slightly crisp bread is a dosa, I believe. And finally, we have the uthappam, which is a thick, chewy, pancake-like creation that has vegetables already cooked in. 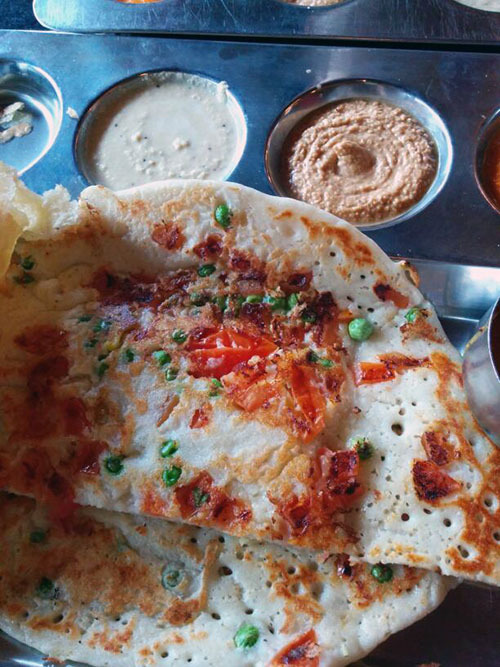 It comes with the same sauces as the dosa above and is also delightful. It’s all pretty inexpensive for quite a lot of food, too. The only downside is that everyone else likes it, too, so it can get crowded. But nothing gets me riled up to brave crowds like delicious bready items.